Our office is located in room 215 on the 2nd floor of the Clough Commons building. The TSC provides OS diagnostics & troubleshooting, OS installation (installation media required), Virus and Spyware monitoring and installation applications free of charge to all students. Visit us today to ensure your system is protected or to identify and remove any possible virus or spyware infection. In order for us to provide our customers with OUTSTANDING SERVICE, please have the following tasks completed, and the following items available when you visit the Technology Support Center for assistance. Need help activating your GT Account or forgot your password? We can assist quickly and ensure your central services are enabled. For online account management, check out the self-serve portal PASSPORT. For assistance with Windows 8, Windows 7, Windows XP, VISTA or Mac OS X, we can help you properly configure your laptop or your wireless smart device. 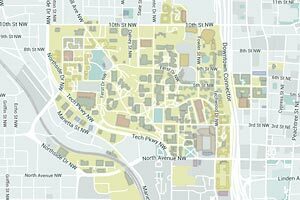 For online configuration assistance, check out The Georgia Tech LAWN (Local Area Walkup & Wireless Network). If you have questions regarding what kind of computer you should buy, the latest in computer technology, smart devices or questions about technology in general, feel free to stop by and ask one of our technicians. We will be glad to assist you! Also, feel free to visit our Demo Area to "test drive" various laptops from Dell®, Lenovo® and Apple®.